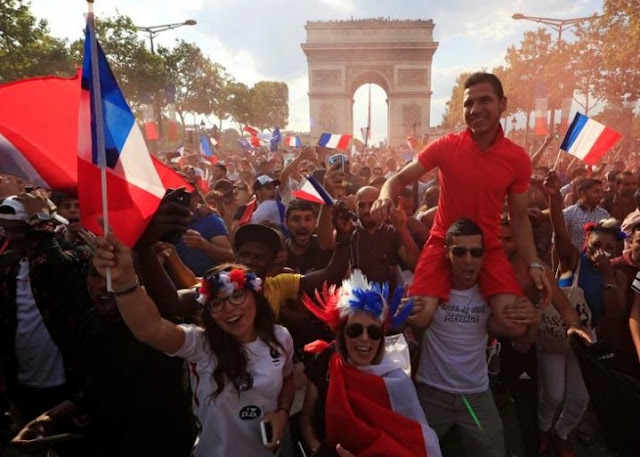 There is wild jubilation and celebration in Paris and other cities in France as the country beat Croatia 4-2 to win soccer’s World Cup in a pulsating final in Moscow. The boom of fireworks and firecrackers filled the air, while drivers honked their horns incessantly to celebrate France’s second world title after their triumph on home soil in 1998. A deafening chorus of “We are the champions, We are the champions” rang out from the Sacre Coeur in the north of the city to the Sorbonne on the Left Bank. Similar scenes erupted in Marseille, Lyon, Lille, Bordeaux and other major cities. The entire area around the Arc de Triomphe, all the way down the two-kilometer-long Champs Elysees and the Place de la Concorde at its end was a sea of singing and cheering people. “It’s just astonishing what they’ve done,” said Josh, 41, who traveled from Brittany to Paris to watch the match with his girlfriend. “Pogba, Mbappe, Grizou (Griezmann) — they’re on top of the world,” he said, naming three of the standout players. “To get a second star (World Cup) after 20 years, it’s just brilliant,” said Tommy Hamon, 23, who was working in Le Deauville, a bar on the Champs Elysees.